On January 21, Evo Morales began his third term as President of Bolivia. In office since 2006, he is now slated to continue as Bolivia’s president until 2020. 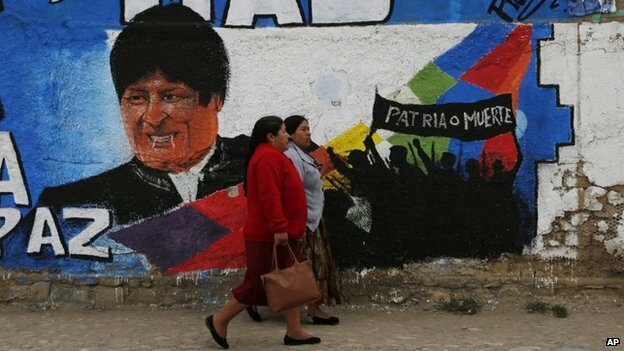 President Morales, who emerged from humble origins to become Bolivia’s first indigenous president, remains very popular having won over 60 percent of the votes in last year’s election. Outside of Latin America, casual observers often lump President Morales into the same category as populist Presidents Nicolas Maduro of Venezuela or Daniel Ortega of Nicaragua. In part, Evo has brought this on himself through his aggressive rhetoric and his ALBA affiliation. In practice, however, he has been a reasonably effective president guiding the country through years of strong and consistent growth, improved (albeit imperfect) macroeconomic stability, increased reserves and decreased poverty. Morales has pursued nationalizations—mostly in utilities—but he has not gone overboard as have his Venezuelan counterparts. He has promoted pro-poor policies in a country in which the majority remain poor. This may not square with what the US would want, but it is not an unreasonable approach. Certain infrastructure advances, such as the cable car connecting El Alto to La Paz, are indisputable. As President Morales prepared for his third term, we can expect his rhetoric to continue to catch headlines. But what Evo says is hardly as important as what Evo does. Moving forward, the key question is whether President Morales will maintain a semblance of level-headed in his policy approach, which has been fundamental to his effectiveness. Economically, Bolivia will face rough global headwinds. Plummeting oil prices are indicative of a tough road ahead for commodities—especially to the degree that falling oil prices force Bolivia to cut export prices on natural gas. Experts felt Bolivia was relatively safe as long as oil stayed above US$80 dollars per barrel (really La Paz would prefer the price closer to US$100 per barrel). Oil is currently far south of US$80, and unlikely to rebound any time soon. A significant dent in public revenue would challenge President Morales’ ability to implement and expand social programs. It will be interesting to see what comes of lithium: will the commodity slump hurt lithium? Or will falling oil prices generate greater interest in lithium? And even if lithium demand is strong, can President Morales successfully take advantage, be it through public or private ventures, to make the most of it? This will be in important part of Morales’ legacy. 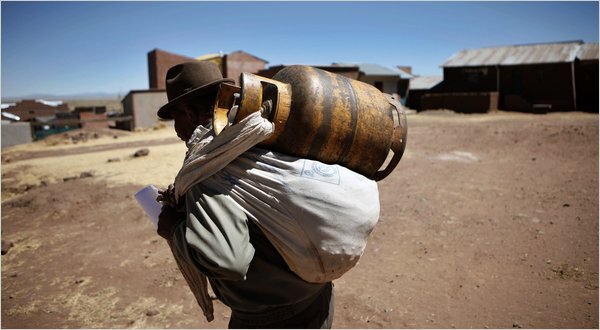 In an era of falling commodity prices, can natural gas continue to propel Bolivian growth? Politically, it should become increasingly clear in the coming year whether Morales will respect the constitution that he himself pushed through in 2009, or whether he will scheme mechanisms that can keep him in power through 2020. His maneuvering to run for a third term suggests that he might not give up power easily. Publicly, he has stated that he will respect the constitution and retire from the presidency at the conclusion of this term. Nevertheless, speculation swirls that he has grown accustomed to the trappings of power. If he successfully amends what is a very young constitution to allow him to run for president yet again, this would be a bad sign for Bolivian institutions, suggestion that the rules of the game are malleable and that the constitution is still a work in progress. Today it might be term limits, tomorrow something different. Either way it would suggest that to Morales, maintaining power in the short term is more important than establishing longstanding political institutions. It is worth noting again that President Morales has not publicly stated a desire to amend or eliminate term limits in the constitution. Rather, people assume he will follow a similar path as his populist compatriots in the region where leaders have sought rule changes to stay in power. In the next years we will see if President Morales is truly a more practical leader than many give him credit to be. This entry was posted in Andean Region and tagged Alba, bolivia, constitution, Economy, el alto, Evo Morales, la paz, Latin America blog, legacy, lithium, natural gas, samuel george, third term. Bookmark the permalink.